More than 260,000 diabetes patients were put at risk of lasting harm or even death during hospital stays last year due to medication errors, a new report has revealed. The study by Diabetes UK found a worrying 9,600 of these patients experienced a potentially life-threatening episode of hypoglycaemia due to poor medication management at hospital. The Diabetes UK report was compiled from visits to hospitals across the UK, with authors speaking to patients with diabetes, inpatient teams, medical professionals and hospital managers. The charity is calling for hospitals to adopt the six key recommendations in its report to make them safer for diabetes patients, lead to better patient experiences and shorter lengths of stay. One in six hospital beds in the UK are currently occupied by diabetes patients, with experts predicting that this number will rise to one in four by 2030. Inpatients with diabetes have higher infection rates and longer lengths of stay (one to three days longer than patients without diabetes), leading to greater NHS spending and workload. 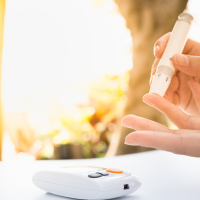 Diabetes inpatient care costs the NHS £2.5 billion a year - 11% of the annual inpatient budget, and Diabetes UK said adopting its recommendations could help significantly reduce NHS spending and alleviate the strain on services. For example, investing £5 million on new diabetes inpatient specialist nursing services in 54 trusts would yield savings of £14 million a year, a net saving of £9 million annually. It also suggests better training for health care professionals to help them understand diabetes and more support to help hospitals learn from mistakes. Emily Watts, the charity's inpatient programme manager and co-author of the report, said: "Nine thousand six hundred people experiencing a severe, potentially life-threatening episode of hypoglycaemia because of inadequate care whilst in hospital, a place where people should feel supported and safe, is shocking and unacceptable. "We hope our report will serve as a wake-up call, and lead to system-wide changes which make hospitals safe for people living with diabetes. "Over a million people with diabetes spend time in hospital every year. It's essential that hospitals are safe places for each and every one of these people. But the sad truth is that currently, not all of them are. "Everything recommended in our report already exists in certain hospitals across England. We want hospitals to stop working alone and start learning from each other's successes." If you're living with diabetes and looking for travel insurance that meets your needs, check out our dedicated diabetes travel insurance and get peace of mind before your next trip.